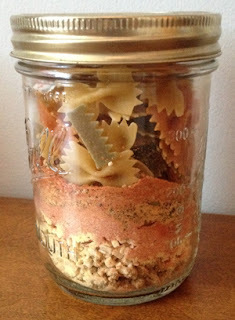 "Meals in Jar" is a method of making up your meals in advance, and storing them in sealed jars, so that all you have to do is add water and you've got yourself a meal! You use dehydrated and freeze-dried products. These are incredibly convenient! Especially for nights where you need a quick meal, or you just aren't in the mood to fix something from scratch but you don't want fast food again. Many Thrive Life Consultants are converting standard recipes to use Freeze Dried & dehydrated ingredients. The first look at these was at a cooking class in in Utah with Stephanie Petersen, aka "Chef Tess". She has a cookbook called "52 Method Meals-in-a-Jar". She also has a blog you an check out. To get the basics of how to do the jars, and sealing, and the basic rules to follow, please check out her FAQ post: 52 Method Jar Info. You can use other noodles in this, we have found we like mini bow ties noodles! We also now cut the recipe in half for a pint (perfect for just the 2 of us) so cut the below in half. I try to make up 2-4 at at time. Bring 8 cups of water to boil. Add contents of jar and stir well. Simmer for about 10-12 minutes or until the noodles are done. Top with Parmesan or Mozzarella Cheese.